If you change motorcycle tyres yourself you will know that balancing a wheel accurately is one of the most important aspects of the job, with the abba wheel balancer it could not be easier. This static balancer will fit all modern motorcycle wheels front or rear. It comes supplied with our unique staged adapter cone design that is CNC machined to ensure an accurate fit inside all metric size wheel bearings. 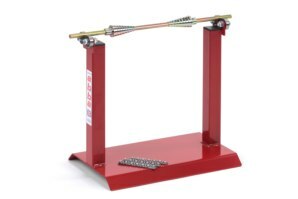 This also allows for much quicker and easier fitment/removal of a wheel when compared with a conventional wheel balancer. 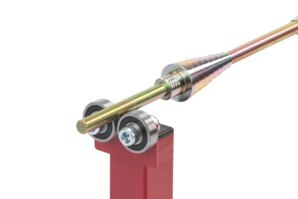 The staged adapter cones are not required to be tightened against the shaft therefor eliminating resistance which enables supreme accuracy when balancing. With four Additional high quality sheilded bearings on the wheel balancer, this makes for friction free very accurate balancing. Our balancer is not a "flat pack" design like most, it comes as a fully welded construction. This means the balancer is always perfectly aligned and super strong for a lifetime of use. Comes complete with motorcycle stick on lead weights and full detailed instructions on balancing a wheel. Our balancer can often be seen in use around many race events inclduing BSB, as its regarded as one of the most accurate and quality balancers money can buy! Optional Single sided adapter is available for balancing motorcycle rear wheels from single sided Swing-Arm machines. Four high quality sheilded roller bearings ensure friction free balancing. 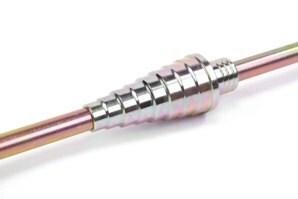 No screws required on the cones themselves, eliminates damaging the shaft. A common issue with cheaper alternatives. Staged adapter cones enable fast and easy setup. Fully welded constructions for perfect alignment and lifetime use. I'm going to change my tyres, do I really need to balance my wheels? Many years ago balancing wheels was not even considered necessary. Now days with modern motorcycles traveling at higher speeds fitted with wider wheels and riding on smooth roads or tracks, an out of balance wheel can have a dramatic effect on motorcycles handling, tyre wear and above all rider safety. My bike has a single sided Swing-Arm, will the abba Wheel Balancer still work? The front wheel can still be balanced using the wheel balancer on its own. For balancing the rear wheel you will require our Single Sided Adapter as single sided swing arm motorcycles do not have bearings housed in the rear wheel. How many wheels will I be able to balance with the weights included? This is a difficult question to give an exact answer as wheels can vary on how out of balance they are. On average you should be able to balance 4 or 5 wheels with the weights included. Additional boxes of wheel weights are widely available online or from local tyre fitting shops. I'm unsure of how static balancing actually works, will I be able to use the abba Wheel Balancer? Balancing wheels is actually a very simple operation, you are effectively finding the heaviest point of the wheel (by using gravity to let the wheel fall to it's heaviest point) and counter balancing this with the addition of lead weights to the opposite lighter end of the wheel. Fortunately, unlike other cheaper alternatives, the abba Wheel Balancer comes with detailed instructions and weights. How accurate is the abba Wheel Balancer? Extremely accurate! 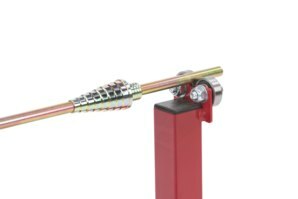 Because the staged adapter cone set does not require tightening against the shaft causing even less friction, combined with the four high quality bearing fitted we would be confident in saying this is the most accurate balancer available on the market today. In fact our abba Wheel Balancer can often be seen being used in British Superbike and other race pits as static balancing is widely regarded as the most accurate method of balancing a wheel. Does the abba Wheel Balancer come with a guarantee? Got a Question about the abba Wheel Balancer? If you would like to ask us a question about the abba Wheel Balancer, simply fill in the form below and we will contact you within two working days. Want to tell a friend about the abba Wheel Balancer? Alternatively fill in the form below and we will send an email on your behalf to your friend, with a link to this page all about the abba Wheel Balancer.